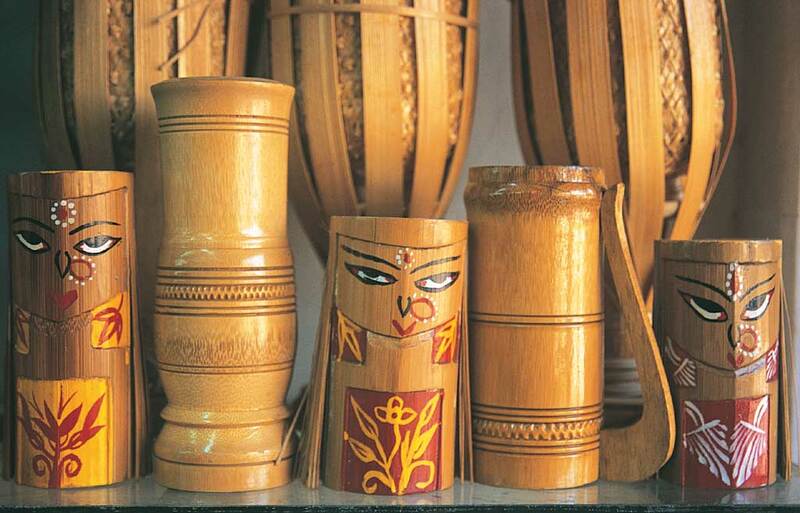 Weaving is an ancient craft of the tribals of Meghalaya – be it weaving of cane or cloth. The Khasis are famous for weaving cane mat, stools and baskets. They make a special kind of cane mat called ‘Tlieng’, which guarantees a good utility of around 20-30 years. The Garos weave the material used for their costumes called the ‘Dakmanda’. Khasis and Jaintias also weave cloth. The Khasis have also been involved in extracting iron ore and then manufacture domestic knives, utensils and even guns and other warfare weapons using it. The Khasi lady wears a dress called ‘Jainsem’ which flows loose to the ankles. The upper part of her body is clad in a blouse. Over these, she ties both ends of a checkered cotton cloth on one shoulder, thus improvising on apron. On formal occasions, worn over the ‘Jympien’ is a long piece of Assam muga silk called ‘Ka Jainsem Dhara’ which hangs loose below the knees after being knotted or pinned at the shoulders. The ‘Tapmohkhlieh’ or head-shawl is either worn by knotting both ends behind the neck or is arranged in a stylish manner as done with a shawl. The Jaintia maidens dresses like her Khasi counterpart but with the additional of a ‘Kyrshah’ – a checkered cloth tied round the head during harvesting. On formal occasions, however, she dons a velvet blouse, drapes a striped cloth called ‘Thoh Khyrwang’, sarong style round her waist and knots at her shoulder an Assam muga piece hanging loose to her ankles. In contrast, the Garo women wears a blouse, a raw cotton ‘Dakmanda’ which resembles a ‘Lungi’ and the ‘Daksari’ which wrapped like a ‘Mekhla’ as worn by Assamese ladies. The jewellery of the Khasis and the Jaintias are also alike and the pendant is called ‘Kynjri Ksiar’, being made of 24 carat gold. The Khasis and the Jaintias also wear a string of thick red coral beads round their neck called ‘Paila during festive occasions. The Garo ladies wear Rigitok, which are thin fluted stems of glass strung by fine thread.